An American veteran of the World War II Normandy invasion returns to France 70 years later to fulfil an ambition to fish the rivers that he crossed as a soldier. Frank Moore and his wife Jeanne, their son, and a number of local anglers who help to make this dream come true. Fishing is a funny old sport, capable of producing a huge range of emotions. But sometimes it transcends the act of catching fish and becomes about a whole lot more. As well as being about the power of fishing to heal old wounds, both mental and physical, this film is about the incredible relationship between Frank and Jeanne, one that’s survived for 70 years. Their love and tenacity is what helped Frank to overcome the horrors of war, and to see how they support each other through thick and thin is quite remarkable. The film is also about the international fellowship of anglers, and the way the locals go out of their way to help Frank achieve the dream of fishing Normandy’s rivers for the fabled Atlantic Salmon. Their gratitude is moving for both Frank and his family, but also the viewer. 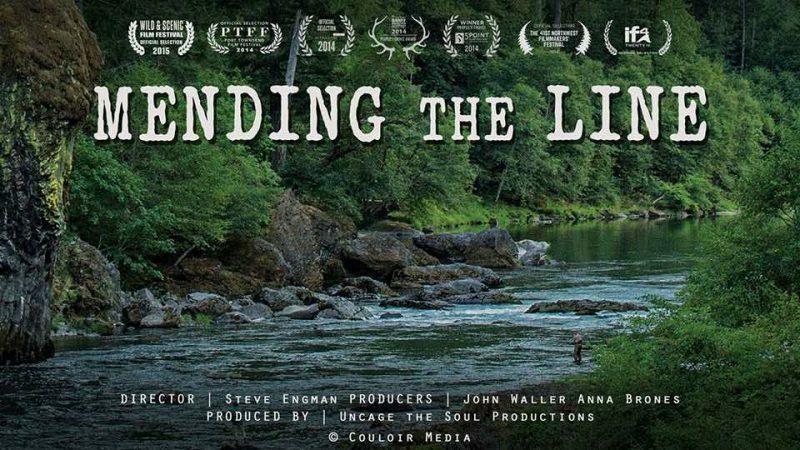 Mending the Line is truly inspiring, and you’ll marvel at the strength of the human spirit and the way that even the distant prospect of a day’s fishing can help people through even the very darkest of times. I don’t mind telling you that it brought a tear to my eye. History buffs, salmon fishermen, romantics. But really, anyone with a soul should find this a moving watch. – Not even war can quash this amazing couple’s love for each other and fishing.